Sage Rosenfels (born March 6, 1978) is an American football quarterback for the New York Giants of the National Football League. He was drafted by the Washington Redskins in the fourth round of the 2001 NFL Draft and has also played with the Miami Dolphins, Houston Texans and the Minnesota Vikings. He played college football at Iowa State. * Originally a 4th round (109th pick overall) draft choice by the Washington Redskins in 2001…Traded to the Miami Dolphins on Aug. 23, 2002…Signed by the Houston Texans as an unrestricted free agent on March 13, 2006…Traded to the Minnesota Vikings on Feb. 27, 2009…Traded to the Giants on Sept. 3, 1010. * Has played in 32 regular season games with 12 starts…Record as a starter is 6-6… Started 10 games in last 2 seasons in Houston (2007 and 2008 and was 6-4)…Career totals include 351 completions in 562 passes (62.5 percent) for 4,156 yards, 20 touchdowns and 19 interceptions…Has thrown a TD pass in 14 of the past 15 games in which he's played…Has been sacked 19 times for 127 yards in losses…Passer rating is 81.2. * In 2009, did not see game action, serving as Vikings 3rd QB throughout the regular season and both playoff games...Was slated to battle Tarvaris Jackson for starting job during the season before Brett Favre came out of retirement and joined the team after the 1st preseason game…Started preseason opener at Indianapolis (8/14). 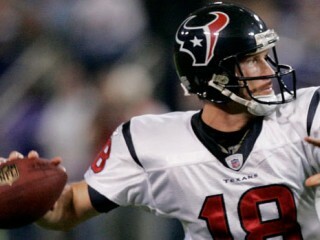 * In 2008, played in 6 games with 5 starts in place of Matt Schaub for Houston…Helped Texans rank 3rd in the NFL in total offense and 4th in passing offense…Completed 116 of 174 passes (66.7 percent) for 1,431 yards, 6 touchdowns and 10 interceptions…Passer rating was 79.5…Threw for career-high 294 yards vs. Baltimore (11/9) in his 2nd start of the season, including a 60-yard touchdown pass to Kevin Walter…Completed 21 of 29 passes and had season-best 103.2 passer rating when he replaced Schaub at Minnesota (11/2), completing 21-of-29 passes in the game…Won final 2 starts of the season at Cleveland (11/23) and vs. Jacksonville (12/1). * In 2007, played in 9 games with 5 starts…Had best statistical season of his career, throwing for 1,684 yards and 15 touchdowns while completing 154 of 240 passes (64.2 percent) for a passer rating of 84.8…Ranked behind only New England's Tom Brady with a 4th-quarter passing rating of 112.9…Threw 11 of his 15 touchdowns in the 4th quarter to lead the NFL…Went 4-1 in his 5 starts, including wins over playoff-bound Tampa Bay and Jacksonville…Guided team to 1st career win as a starter at Oakland (11/4)…Scored 1st career rushing touchdown on a 5-yard run vs. Denver (12/13)…Replaced Schaub in the 2nd quarter vs. Tennessee (10/21) and threw for 290 yards and career-high 4 TDs, with 249 of the yards and all 4 TDs coming in the 4th quarter, as he rallied the team from a 32-7 deficit in the 4th quarter to take a 36-35 lead before a late Titans FG gave them the win…Had a pair of season-long 53-yard passes: a touchdown Andre Davis vs. Tennessee (10/21) and a 53-yard gain to Ahman Green at Oakland (11/4)…Threw a touchdown pass in each of the 9 games he played and had 3 multiple touchdown games. * In 2005, played in 4 games with 1 start in his final season in Miami…Completed 34 of 61 passes (55.7 percent) for 462 yards, 4 touchdowns and 3 interceptions…Sparked the biggest comeback win in Dolphins history vs. Buffalo (12/4) when he rallied the team from a 23-3 4th-quarter deficit to take a 24-23 win, throwing for 272 yards and a pair of touchdowns…Hit Ronnie Brown on a 23-yard score with 7:35 remaining to cut the Bills lead and threw 4-yard game-winner to Chris Chambers with :06 remaining in the game…Entered game vs. Jets (12/18) in the 2nd half and engineered another 4th-quarter comeback win…Trailed 17-10 entering the final quarter, Rosenfels guided the Dolphins to 2 touchdowns, including a 50-yard scoring pass to Marty Booker…Made his 1 pass attempt in 4th-quarter duty vs. Kansas City (10/21) memorable with a career-long 77-yard touchdown to Chambers. * In 2004, played in 3 games with 1 start…Completed 16 of 39 passes (41 percent) for 264 yards, 1 touchdown and 3 interceptions…Made 1st career start in season finale at Baltimore (1/2/05)...Threw a 76-yard TD to Chambers on the 1st play from scrimmage and ended day with 264 yards…Only other action of the season came in games vs. Cleveland (12/26) and at San Francisco (11/28) when he didn't attempt a pass. * In 2003, played in 2 games and completed 4 of 6 passes for 50 yards and a touchdown…Threw 1st career touchdown pass in 1st action of the season, hitting Donald Lee for a 21-yard score with :20 left in the game at Tennessee (11/9)…First career completion was a 5-yarder to Travis Minor in Tennessee game. * In 2002, played in 4 games and attempted all 3 passes in his 1st career game at Green Bay (11/4) on Monday Night Football, going 0-for-3…Spent training camp and bulk of preseason with Washington before being traded to Miami. * In 2001, spent rookie season primarily as Redskins' 3rd quarterback…Spent 2 weeks as the backup but did not play. * Was full-time starter as a junior and senior at Iowa State…Guided Cyclones to Insight.com Bowl against Pittsburgh as a senior in 2000, the 1st bowl game for the school in 22 years…Team went 9-3 in 2000, including bowl win over Pitt…Ran for 14 TDs during his collegiate career, 10 of those coming as a senior…Served as co-captain as a senior…Redshirted as a freshman in 1996. * Wife (Maria)…The couple has a daughter (Ava) and a son (Peyton). * Multi-sport athlete at Maquoketa High in rural eastern Iowa...Earned All-State honors at DB…Lettered in football, basketball, baseball, tennis and track...Earned All-State honors in football, basketball and baseball and ran in the state track meet...Played No. 1 singles for the Cardinals tennis team. * Member of National Honor Society at Maquoketa High. * Majored in marketing at Iowa State. * Got involved in the community early in his Vikings career, helping stuff Easter baskets for victims of the Red River flooding in the spring of 2009.